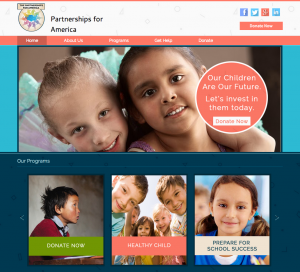 This past week we had the privilege of launching a new custom WordPress website for the Partnerships for America. Our client, chief executive officer Ann McIntyre, works tirelessly coordinating volunteers and funds to support mothers and children. The Cuddle Me diaper bank provides free diapers and other basics of living to children from birth to age three. Other off-shoot programs support children through their childhood, teen years, and prepare them to be self-sufficient adults. The need is great for these children! Please visit the Partnerships site, and if you feel moved to do so, consider making a donation in any amount to this great cause. Thank you to Scott, Jacob, Alison and their colleagues for the great job on our new and improved site! We are already getting positive comments from all who visit the site. The PFA is a finalist organization in the Toyota 100 Cars for Good. Our voting date is November 9th and if we are one of 2 organizations that receive the most votes that day, Toyota will give us a new Sienna van to be used for our Cuddle Me Program donations pickup and deliveries. Please visit the Facebook page for Toyota 100 Cars for Good, https://apps.facebook.com/carsforgood, and vote for the-pfa on November 9th.